Last week, we featured a Prize-Winning Animation of 17th Century London. 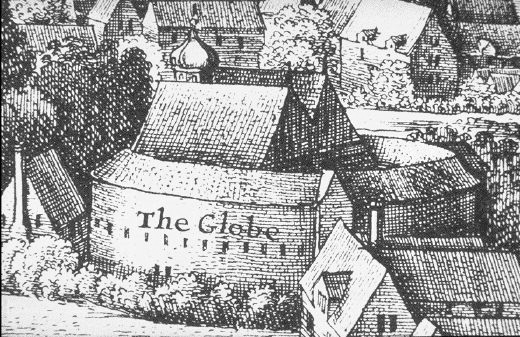 In many ways, it could be paired with these short virtual tours of the Globe Theatre. Built in 1599 by Shakespeare's playing company, the Lord Chamberlain's Men, the original theatre hosted some of the Bard's greatest plays until it burned down 14 years later. In 1613, during a performance of Henry VIII, a stage cannon ignited the thatched roof and the theatre burned to the ground in less than two hours. Rebuilt with a tile roof, the theatre re-opened in 1614, and remained active until England’s Puritan administration closed all theatres in 1642. A modern reconstruction of the Globe, named "Shakespeare's Globe," was built in 1997, just a few feet away from the original structure. If you want to get a feel for what Shakespeare's theatre looked like, then look no further than this virtual tour. All you need is this free Quicktime plugin for your browser and you can take a 360 tour of the stage, the yard, the middle gallery, and the upper gallery ... all without leaving your seat. Wow! This is a great resource and so awesome.